The US Missile Defense Agency (MDA) has released video of a test conducted yesterday using a dummy missile that was launched north of Hawaii. The missile was obliterated by another missile shot from Alaska by the THAAD defence system. And it’s a not-so-subtle message to North Korea that the US is ready to shoot down any object that may threaten US airspace. North Korea recently tested an intercontinental ballistic missile (ICBM) that many experts believe could reach Alaska, despite the fact that the isolated country has yet to prove that it can miniaturise a nuclear weapon to fit on an ICBM. But that hasn’t stopped the US military from aggressively testing its offensive and defensive capabilities as the situation on the Korean peninsula heats up. The newly released video shows a US Air Force C-17 launching a dummy missile from over the Pacific Ocean, somewhere north of Hawaii. 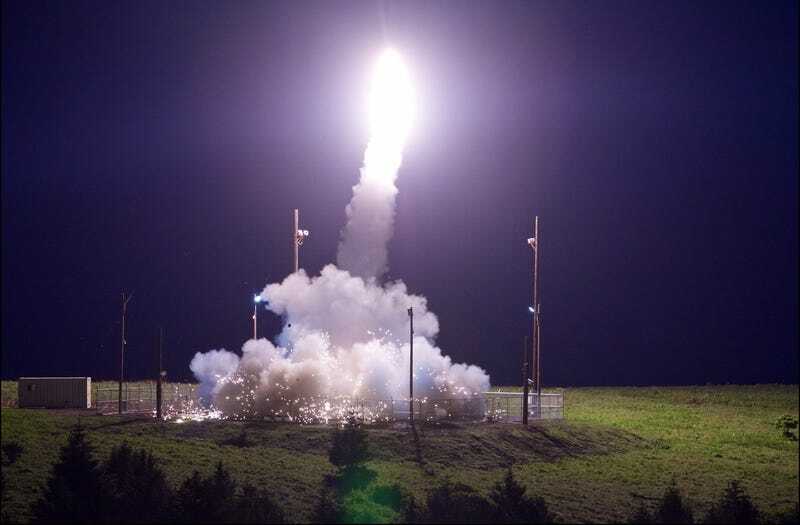 The THAAD missile defence system stationed at the Pacific Spaceport Complex in Kodiak, Alaska tracked the launch and sent out its own missile to destroy the dummy target. “This test further demonstrates the capabilities of the THAAD weapon system and its ability to intercept and destroy ballistic missile threats. THAAD continues to protect our citizens, deployed forces and allies from a real and growing threat,” MDA Director Lt. Gen. Sam Greaves said in a statement. The THAAD system uses kinetic energy rather than explosives to neutralise an incoming missile. The missiles launched from the THAAD system are designed to simply destroy the target using its own force. But even if the “defensive” missiles are inert, they can still pose a problem if they don’t hit their target. Jeffrey Lewis from the Middlebury Institute of International Studies recently wrote in the Daily Beast about how a misfire by the THAAD missile defence system could accidentally trigger a nuclear war. And it’s pretty terrifying. Moreover, we can’t assume that Russia would realize the launch from Alaska was a missile defense interceptor rather than an ICBM. From Russia, the trajectories might appear quite similar, especially if the radar operator was under a great deal of stress or pressure. In 1995, for instance, the Russian military mistook the launch of a sounding rocket from Norway for a launch of a nuclear-armed Trident missile from the sea and alerted Boris Yeltsin. The Norwegian rocket was actually flying away from the Russia, but it took several very tense minutes for the Russian warning system to figure that out. It doesn’t matter how Russia’s early warning system ought to work on paper, the reality of the Russian system in practice has been a lot less impressive. The THAAD system (an acronym for Terminal High Altitude Area Defense) is also deployed in South Korea and remains incredibly controversial there. Many South Koreans think it merely heightens tensions in the region and doesn’t make anyone safer. North Korea has naturally been very interested in the THAAD system, even sending a drone at least 177 miles into South Korea to spy on it before it crashed. The drone was discovered to have photos of the THAAD missile system on a shop-bought Sony camera. 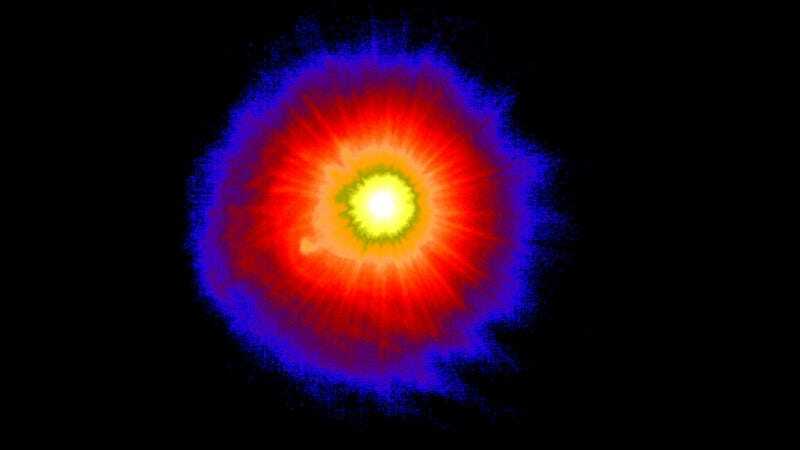 The US military touts yesterday’s test as the 14th successful test of 14 attempts from Alaska. And if things continue down a path of war, we can probably expect plenty more where that came from. Here’s hoping that Donald Trump and Kim Jong-un don’t bring us to that.